These days, exhibitions of 3D wallpaper and paintings are popping up — and popping out — everywhere. They’re popular with merchants, art galleries, museums, and the public. Many of these exhibits depict realistic animals that are mythical or extinct, especially dragons and dinosaurs. Those gleaming teeth and shiny scales really come alive in three dimensions. While these works are often beautiful, you might feel that they’re not quite enough for your establishment. Indeed, many consumers are so familiar with 3D images — whether in paintings or at the movies — that you’ll need a stronger hook to draw a crowd. There are so many examples of excellent 3D painting and wallpaper displays. For starters, a special presentation will tour museums starting in 2019. Guests will enter a room and view an enormous wraparound screen. As you might expect, colorful and ferocious dino holograms will leap out at them. Paleontologist Jack Horner helped develop these stunning images based on the latest scientific evidence. In 2013, the Shenyang Art Gallery in Tianjin, China, introduced huge 3D pictures, many of which depict animals such as elephants, fish, and dinosaurs. The twist is that visitors can stand near these paintings, and it looks like they’re part of the action. For instance, when people crouch in front of the menacing jaws of the T-Rex, it seems as though the dino’s reaching out and grabbing them. For its part, in 2017, England’s Wolverhampton Art Gallery started showing off the masterpieces of four artists who specialize in paleontology. Some of these works are rendered in three glorious dimensions. Once you have your 3D paintings or wallpaper ready, you might start looking for robotic dinosaurs to really wow the customers. My Dinosaurs has you covered. This company could provide you with a T-Rex model. Or maybe a Megalania, which is a gigantic Ice Age lizard, is more your style. For a little medieval flair, a smoke-exhaling dragon robot might do the trick. All of these creatures can blink, breathe, wiggle, roar, and more. These beasts can guard your 3D paintings, and people can pose for photos with them. You can feature them in your ads. You could place informational cards beside them so that your visitors can learn more about them. Maybe couples could even get married in front of these animals! While 3D is great, animatronics will always lend your displays a thrilling extra dimension. 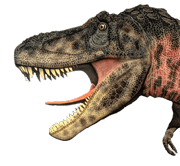 This entry was posted in Uncategorized and tagged 3D dinosaur model, animatronic dinosaur head, Dinosaur wallpapers, realistic animal.